For which age group and gender are these parties suitable for? We think everyone deserves a bit of superhero magic! Our parties are perfectly suited for boys and girls ages 3 and up. We also provide customized packages for corporate events and festivals. How many days in advance of the actual event, should the party be booked? We’d say the sooner the better. We work on a first come first served basis. So the earlier you inform us of your event, the better the chances of you getting your preferred date, time and favourite superhero to attend. Booking at least a month in advance is recommended. Is the contact form sufficient to confirm a booking? The contact form is the first step in sending us your event inquiry. Once we receive your event details, our event planner will confirm the availability of your request, and process your deposit (payable via credit card or company check) to confirm your booking. How do I pay the party fee balance? We are happy to accept payments by cash, check, and credit card. Your event planner will discuss payment options with you prior to the party. Can we hire more than one Superhero for a party? Absolutely! The more the merrier. In fact, we offer discounts on multiple bookings. Are there any extra costs other than what’s indicated in the party packages? The pricing listed in our party packages section is a good indicator of the cost. Apart from this, you may need to pay an additional travel fee depending on the travel distance. Do I need to arrange any additional items for the Superhero party? The package we offer is all inclusive so you don’t have to worry about getting things organized. But we would appreciate an accurate estimate of the audience to cater for the party supplies and associated costs. Is the superhero performance scripted or improvised? Our superheroes stay in character all through the event, but each event is different. The performance will be a combination of both rehearsed elements and on-the spot improvisations. Also, all aspects of the event including the presentation, party games and items included as part of the performance will be discussed with you prior to the event. How much seating space is required for the superhero party? We are happy to accommodate whatever space you have available – in your home, the backyard, a nearby park, gym or swimming pool. The only pre-condition being that there is adequate space to interact with the guests. What setup is required for the Superhero? It is recommended that you clear as much area as possible for the Superhero to be able to perform and play with the kids. The Superhero will need two chairs to sit upon and arrange the supplies they are bringing. Once your deposit has been received, it is non-refundable. If you wish to cancel and not reschedule your party and it is less than 14 days before your booked date, you will lose your full deposit. We appreciate your understanding as we have made this our priority to specially reserve your requested Superhero for your date and time. Once your deposit has been received, it is non-refundable. If you wish to reschedule your party and it is less than 7 days before your booked date, there is an additional $50 fee to book a new date and it is based on character availability. We appreciate your understanding as we have made this our priority to specially reserve your requested Superhero for your date and time. The customer agrees to hold and keep harmless The Superhero Company it’s Agents and Performers from any and all property damages and bodily injured damage caused by the customer’s guests or other persons attending the party. The customer agrees that the Superhero Company is not responsible for severe inclement weather or acts of God that may cause the cancellation of our Performer attending your party. 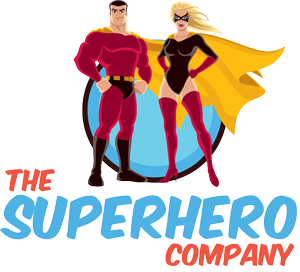 In the event of bad weather, illness, or events beyond our control, The Superhero Company reserves the right to reschedule your Superhero party. In extreme circumstances, where our Superhero cannot get to your party (on the day of your scheduled event), we pride ourselves in providing the most excellent customer service and will provide your child with a complimentary Superhero party for a mutually agreed upon future date, and fully refund any deposit that has been made.